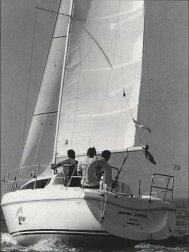 The Leisure 24 was designed in 1996 by Simon Cory, to be produced by the Cory yard at Sandwich in Kent. "A balanced modern rig design, high technology twin keels, and a long waterline length contribute to a sea kindly design that will look after the crew, and is fast on and off the wind." As far as the Leisure Owners Association is aware only one prototype yacht was ever built. The following is taken from the L24 brochure. Shallow draft and good sailing ability enables quieter rivers and creeks to be explored, and use of anchorage's and berths that other yachts of this overall size cannot reach. The one piece moulded hull is built in GRP with moulded twin keels (fin was also available). The deck has a moulded non slip finish, with timber stiffening under the fittings. The yacht normally has a white hull and deck, with a dark blue water line. A Lombardini 8hp diesel engine with shaft drive is standard with a 15 gallon fuel tank. Hand and electric bilge pumps are fitted. On deck the cockpit is safe and comfortable. For example coach roof grab rails and deck jacklines are standard. The mast and boom are silver anodised, rigging is in stainless steel. Halyards and reefing lines are led aft which means that sail handling can be safely carried out without leaving the cockpit. Roller furling on the foresail is standard. Slab reefing is fitted to the mainsail. Down below the fore cabin has two single berths. The main cabin has a double berth aft, and the dinette table can also be lowered to provide a further double berth. A sea toilet is standard as is a wash basin and fresh water supply. The galley has a stainless steel sink and a gas hob grill. All internal woodwork is finished in oak, and varnished. A VHF radio, log and echo sounder are all fitted as standard. We have no yardstick information for the Leisure 24.